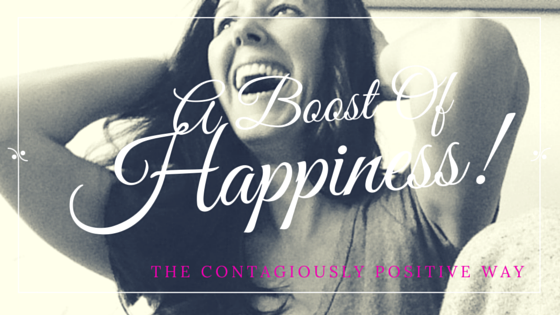 Contagiously Positive » Give Yourself A Happy Boost! Do you look to other people to make you happy? Do you forget the things that make you happy in difficult times? Do you start your day off happy, but can’t seem to stay that way throughout the day? If you answered yes to any of these questions, what you need is a Happy Boost List. A Happy Boost List goes like this: What is happening in your life when things are really working? Think about a day when you were really happy. What was happening that made it so great? Those are the things that will make it on your list. This list is what you will turn to when you need to give yourself a happy boost. So often, we look to others to make us happy, but it actually starts with us. There are things that we can do, without relying on others, to get back to feeling more centered and happy. It can be the simplest of things that can change the channel in our mind. Call a friend who you know will make you laugh. Look at pictures of puppies. Do something special for someone you love. Make a gratitude list and read it when you feel down. What’s on your list? Let’s inspire each other and share our lists. If you have something that makes you happy, I would love to hear what it is. Share in the comments below. Sharing is Contagiously Positive!